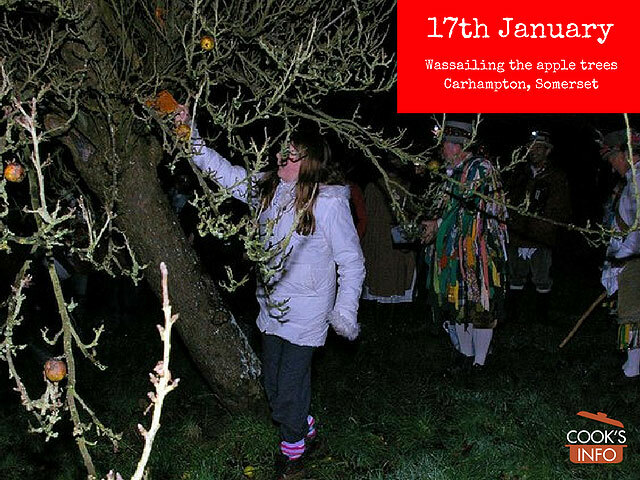 Apple Trees will be wassailed tonight in Carhampton, Somerset, as part of a centuries if not millennia old tradition of wassailing across England. Wassailing provided a fun evening and a time for revelry after Christmas and New Year were over and the dark, cold nights of winter had set in. Traditionally, it was mostly done by men in high spirits, into the high spirits themselves. A Wassail Bowl full of cider was carried out to the orchard for the tree, in addition of course to the cups that the men carried for themselves. You didn’t Wassail every tree in the orchard; you picked the oldest one and gathered around it. 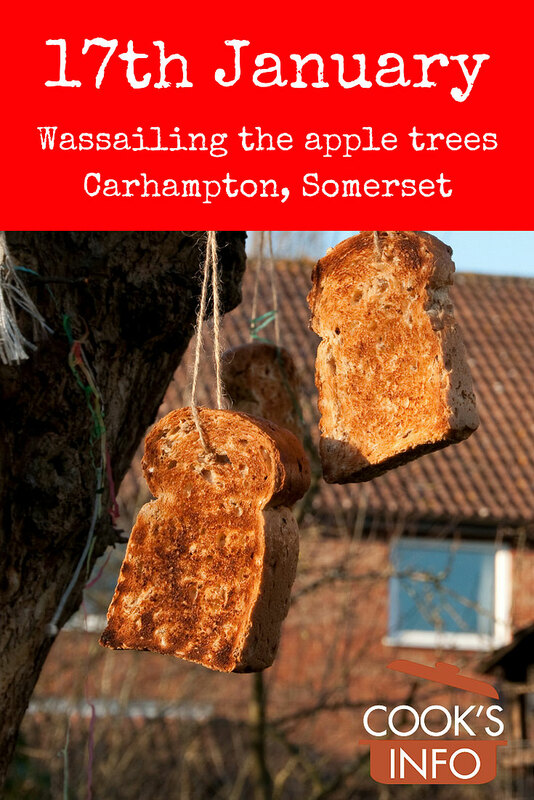 A piece of toast made from white bread would be dipped in the Wassail Bowl, and placed either on the roots or in the branches of the tree to attract good spirits. One of several possible Wassail songs would be sung, sometimes several times as the crowd got into the swing of things. Then, the cider in the Wassail Bowl would be poured over the roots of the tree, and the men would truck back to the house for more fun and merry-making. It was recorded in Kent in 1585 as being done by the teenage men of the villages. In Devonshire, the tradition was that when the men came back to the house, the women would have some special type of meat roasting for the men as suited this festive occasion. Whatever the weather, though, the women wouldn’t allow the men back into the house until they could guess what it was the women were roasting. The man who finally guessed would get the choicest piece that year, and, no doubt, the gratitude of his fellow Wassailers if freezing rain had been coming in sideways. In other traditions, people or animals were Wassailed. In the old, Julian calendar, Wassailing the Apple Trees used to be done on Twelfth Night, January the 6th. On Wednesday, 3 September 1752, the calendar was advanced by 11 days, so that suddenly, it was the 14th of September in the Gregorian calendar. In some parts of England, such as West Sussex, wassailers have stuck with the date of January 6th, keeping wassailing part of Twelfth Night. Since the 1930s, the locals have settled on the 17th of January as their date. The festivities take place in an orchard next to the Butcher’s Arms pub. So merry let us be. “Wassail” means “good health”. It comes from the Anglo-Saxon words “Wes” (“good” or “well”) and “Hael” (“health”). In Sussex, some used the term “howling” the orchard, which may have reflected on the quality of the singing after several good pints of cider by the farmers.